Flexural rigidity of mat and soil modulus of subgrade reactions are not common term to foundation engineers who are analyzing and designing a mat foundation with the rigid beam method as discussed in earlier posts. They are used to assume the infinite rigidity of mat foundation and above two terms are totally ignored. This assumption leads to a unrealistic modeling of mat foundation as discussed before. Conventional methods were/are used as they are simple and complexity in elastic analysis like finite element method cannot be solved easily as computing device are not available to foundation engineers. Now-a-days due to revolution of electronic calculation method using computer programming numerous types of input of parameters and their resulting solution can be predicted within minutes(like solution of any degree of matrix can be solved within few seconds). The advanced silicon chip technology provides computer extensive capability to solve laborious calculations and new advancement of these technology make such devices cheaper than ever. Thus chances of errors and limitation of input many parameters are removed and solution like finite element method can solved easily. 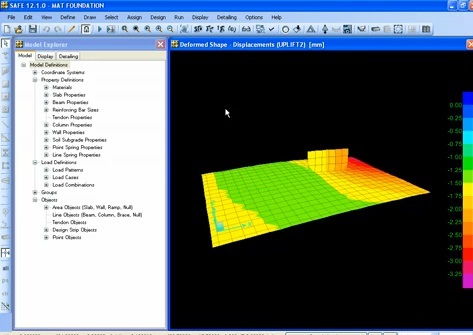 We emphasize on the finite element method as it is the finest way to analyze mat foundation. In this method soil beneath mat is considered as elastic continuum and the mat itself as a plate. The finite element method of mat analysis can be solved conveniently with software “SAFE”. Friends keep an eye on the next posts to have an idea about SAFE to solve mat.